The Career home for the Fire Fighter, your Sim will work between the hours of 9:00 PM and 5:00 AM. The Fire Hydrant is the tool you can obtain from The Hobby Shop to train this skill at home. How can you tell which neighbors have fire hydrants for that part of the training quest? It is found to the left of the city park on that main north-south street. I need to send my sim to work and i change the time what hour i need to change? I have a goal to practice firefighting with my NEIGHBOUR'S fire hydrant. It shows the world icon next to the goal. How do I do that? 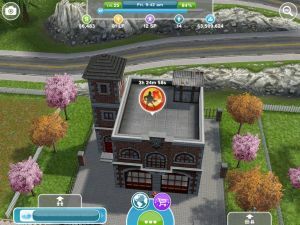 I've tried going to the next simtown's fire station but it won't let me. Can more than one sim be a fireman?